Just two days after a report that the Milwaukee Brewers made an offer to free-agent pitcher Yu Darvish, there’s word that they have now put together a trade proposal with Miami for outfielder Christian Yelich. National Sports Radio host Craig Mish of SiriusXM Radio tweeted the report on Tuesday. The Brewers have been shopping outfielder Domingo Santana, who is coming off his best year in the majors with 30 home runs and 85 RBI and there’s a good chance that he would be a player to be in that trade mix. Yelich told Miami’s new management that he wants to be traded after the organization began cutting payroll with the offseason trades of Giancarlo Stanton and Marcell Ozuna and second baseman Dee Gordon. Yelich, who hit .282 with 18 homers and 81 RBI in 156 games for the Marlins last season, has four years left on his current contract. He’s scheduled to make $7 million in 2018. The deal also includes a $15 million team option in 2022. Overall with Miami, in 643 games, Yelich has a .290 average with 59 homers, 293 RBI and 72 stolen bases. 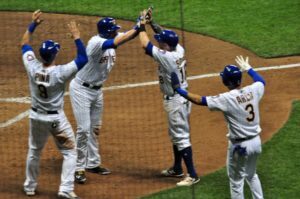 Brewers celebrate one of three 8th inning home runs! The Milwaukee Brewers clubbed four home runs, including three in their eight run 8th inning to knock off the Miami Marlins 10-2 at Miller Park. 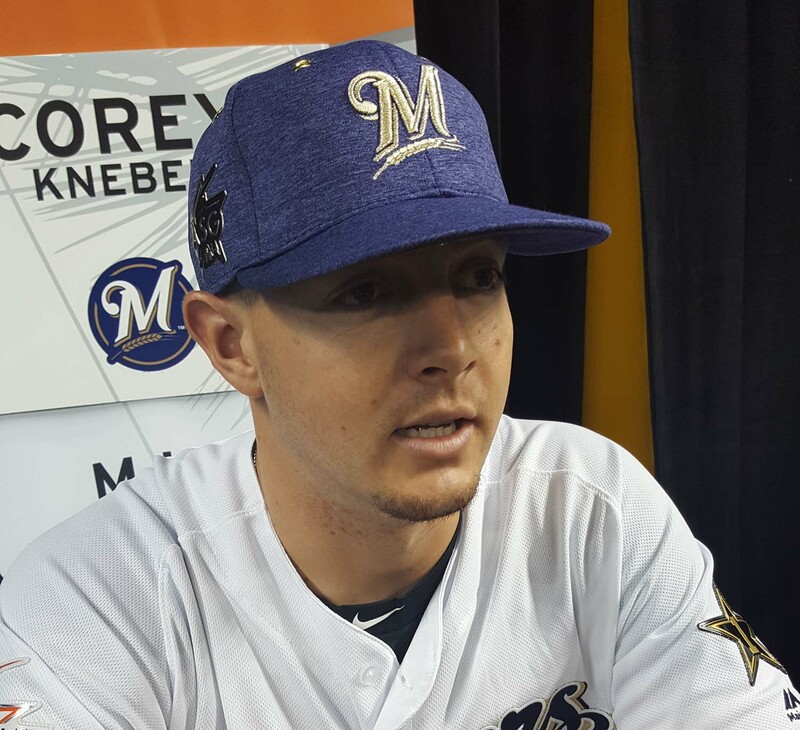 The Brewers played the visitors role in their own ball park. Eric Thames snapped a 2-2 tie in the 8th with a solo home run, his third in three games. Neil Walker later followed with a grand slam and eventually, Domingo Santana clubbed a three run home run in the big 8th. 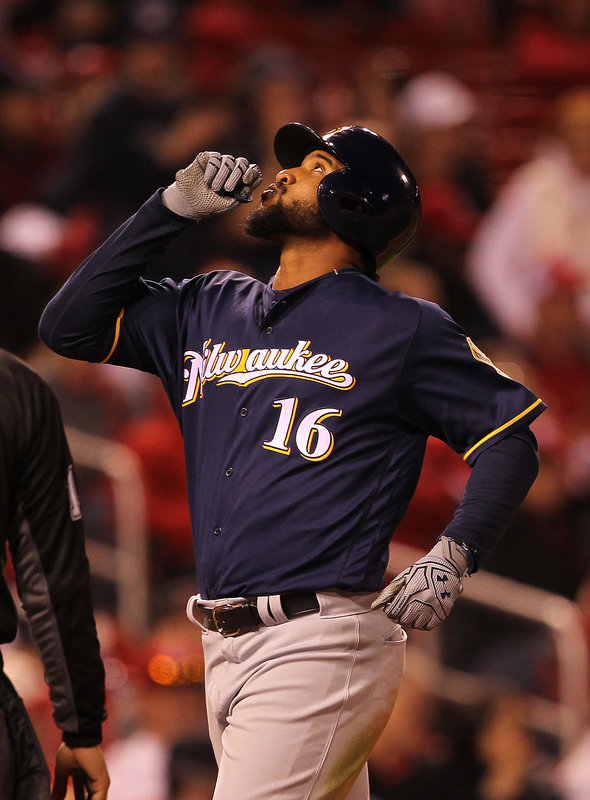 Jeremy Jeffress made his first career start for the Brewers and breezed through the first inning. But he surrendered two runs in the second to tie the game 2-2. 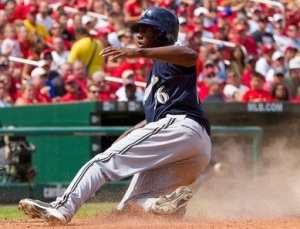 The Brewers had jumped out to a 2-0 lead on Stephen Vogt’s home run in the top of the second. 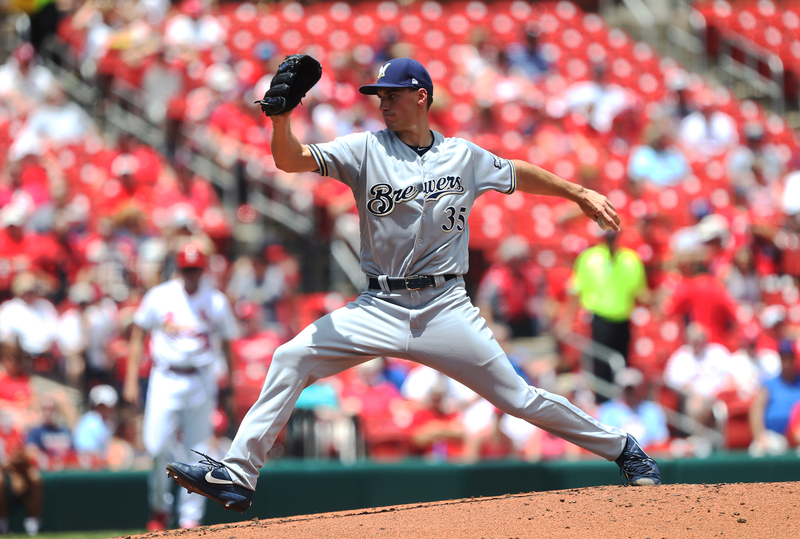 After Jeffress, Brewers manager Craig Counsell would use seven more pitchers to close out the victory. The Brewers kept pace with the division leading Chicago Cubs, who knocked off St. Louis 8-2 earlier in the day in Chicago. The Brewers remain 3 games behind the Cubs. The Brewers had 19,369 fans show up for what was supposed to be a road game. 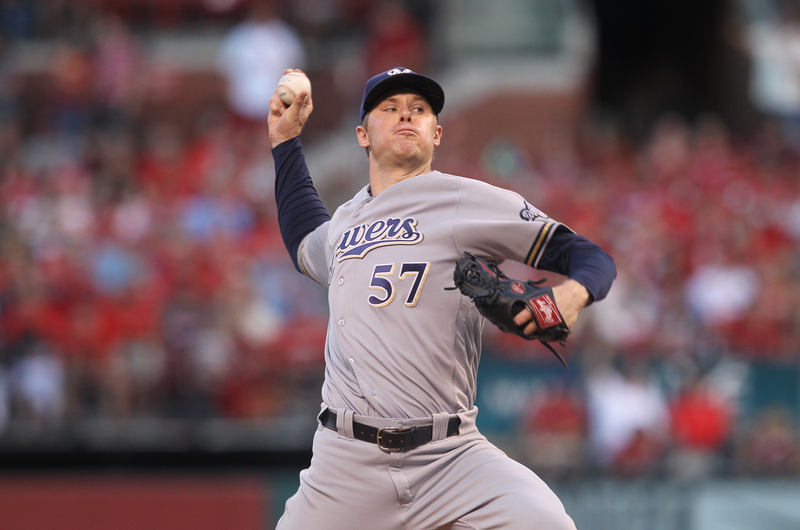 Game two of the series is tonight at Miller Park (6:10 p.m.). Zach Davies (17-8, 3.67) faces Adam Conley (6-7, 5.23) in the pitching matchup. 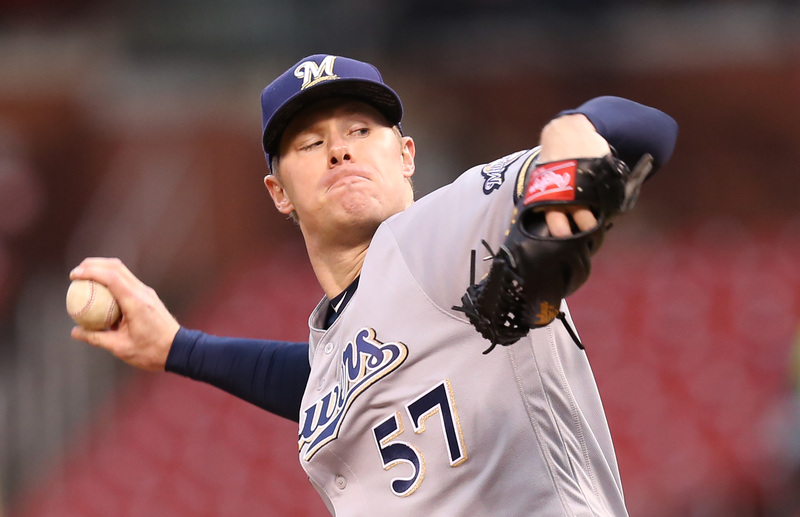 Pitching on three days rest, Milwaukee pitcher Chase Anderson worked 5 1/3 innings to help the Brewers knock off the Pittsburgh Pirates 8-2 in the series finale at Miller Park. Anderson allowed both runs on seven hits with a walk and a pair of strikeouts to pick up his 10th win (10-3) of the season. Eric Thames also homered to key a four-run third inning. Rookie Brett Phillips got a start in center field and drove in three runs. He also threw a runner out at the plate in the fourth inning. Andrew McCutchen gave the Pirates an early 1-0 lead with his 25th home run of the season and the 200th of his career. The Brewers tied it in the bottom of the first on a Hernan Perez single. The Brewers played without right fielder Domingo Santana, who is dealing with right trapezius tightness. Ryan Braun was also given the day off in left.